Survation polled 1,546 adults over the age of 18 in GB & NI online on behalf of Leave.EU on November 16th – 17th. Standard margin of error 2.5%. Full data tables are available here. Do the Public Back Intervention in the Wake of the Attacks in Paris? 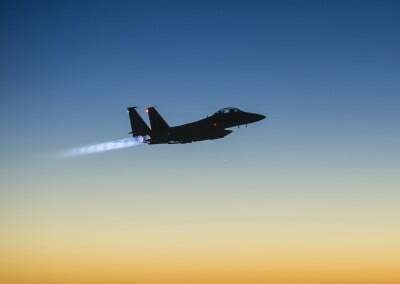 When asked which option the public believe would be the best way to combat the threat posed by IS, only 15% believe that the UK, like France should independently launch airstrikes on IS targets immediately, only slightly higher than those (13%) who say the UK should stay away fro the situation completely. 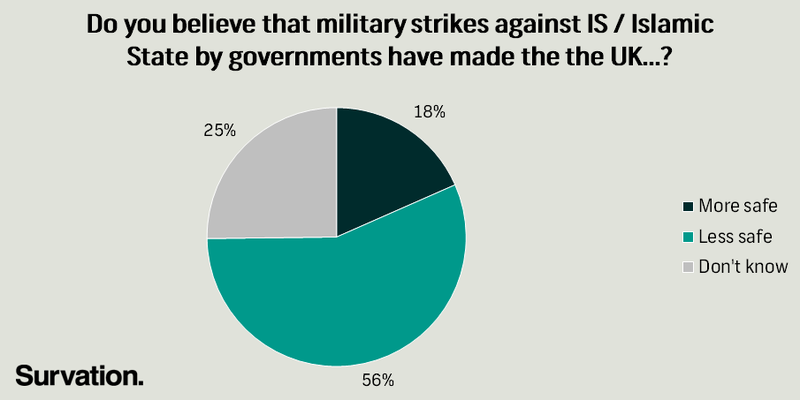 A majority (52%) would support a more measured, multilateral response, military or otherwise, backed by a UN resolution. 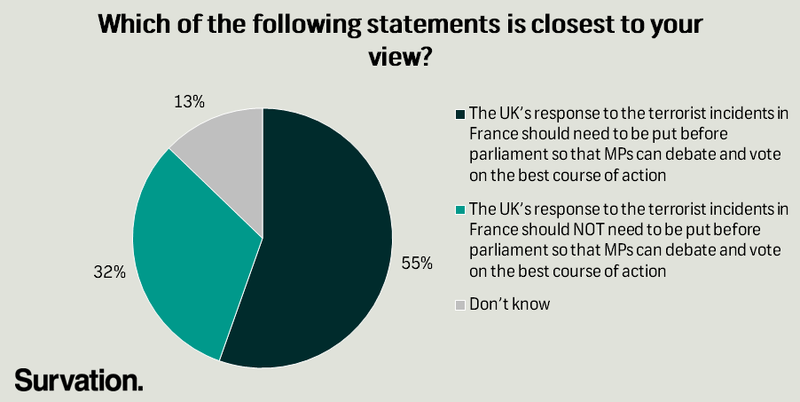 More than half (55%) of the public (57% of CON voters and 63% of LAB voters) think that the UK’s response to the Paris attacks should need to be put before Parliament so MPs can debate and vote on the best course of action. Is membership of the EU Considered Important To the UK’s Safety And Security? Last week, David Cameron said that the question of leaving the EU was “not just a matter of jobs and trade, but of the safety and security of our nation.” The poll asked the public which of the following statements was closest to their opinion, with 59% saying that EU membership made the UK either less safe or made no difference. In Survation’s last poll, conducted as David Cameron set out his demands for renegotiation, the public did not consider his renegotiation proposals popular in comparison to other alternative proposals – such as restricting the automatic right of EU citizens to live and work in the UK. This new polling asked the public whether Cameron not renegotiating this automatic right would make them more or less likely to vote to leave the EU, finding that nearly a third (30%) said that they would be more likely to vote to leave if the Prime Minister does not renegotiate this. At present, David Cameron has NOT demanded renegotiation of the automatic right of EU citizens to live and work in the UK as part of the UK’s renegotiation package before the upcoming referendum. This automatic right allows EU citizens to live and work without restriction across the borders of the 28 nation states of the EU. If David Cameron did NOT renegotiate this automatic right, would this make you…? An Australian-style points system is one proposed method which the UK could use to limit the number of people from the EU to live and work. This particular system has strong support among the public, with more than three-quarters (76%) saying that the UK should, rather than should not, use it to restrict the free movement of labour from other EU countries. 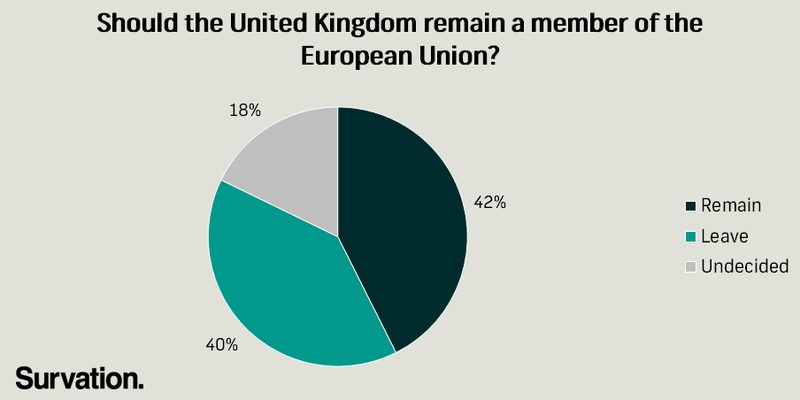 The poll also included Survation’s latest EU Referendum Voting Intention. Our latest poll finds ‘Remain’ back with a narrow lead, but with one in five voters (18%) still undecided, both camps clearly have the potential to pull away from the other. 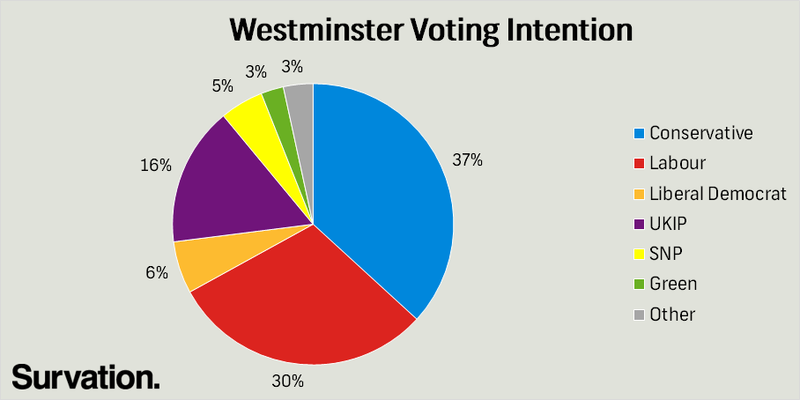 In Westminster voting intention, the Conservatives continue to have a lead over Labour, this latest polling giving them seven percentage points over Labour. The Lib Dem’s fortunes are yet to improve since the General Election, whilst UKIP continue to maintain support since May. Fieldwork November 16th – 17th. Standard margin of error 2.5%. Full data tables are available here.